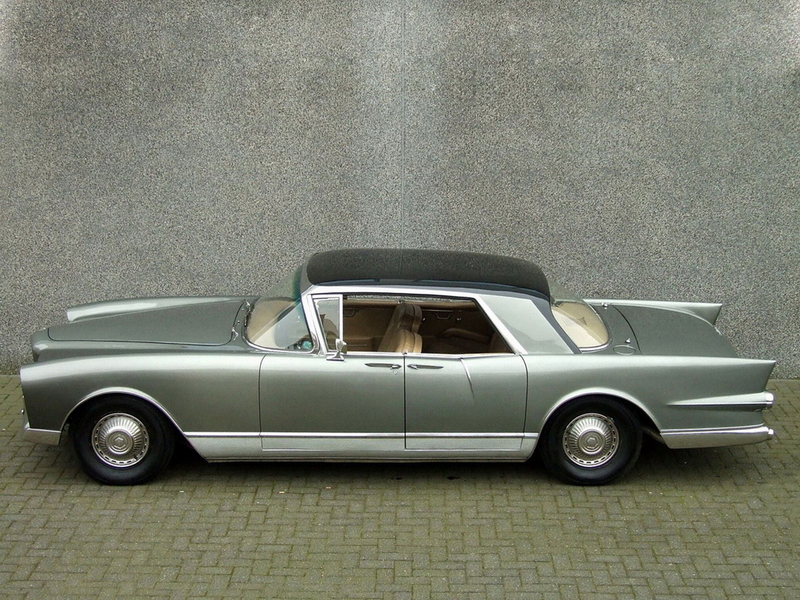 Facel’s only four door car, but also pillarless. Daninos din’t want to make a four door car but ‘people asked me for four doors’. It was a mistake but once built, he wanted this to be the French President’s car. However, its American engine failed to find favour with President de Gaulle although his wife used one. Twelve were sold to French ambassadors around the world. Three different variations: the eleven EX cars including the prototype. Then came 135 EX1 cars, followed by the outwardly different eight EX2 models, 154 in total. The EX2 is in the foreground below, the EX1 behind it. Overall dimensions were the same for all cars: 5.23m long x 1.83m wide x 1.38m high and weighing in at 1920 kilos. They all drove through either Pont-a-Mousson’s four speed manual gearbox, or the Chrysler Torqueflite three speed automatic but automatics had a single Carter AFB carburettor whereas manuals had twin carbs. There were four different power units available from Chrysler. Initially there was the C-300C 6.4 litre/392 cu in V8, giving 325 bhp at 4600rpm. Then came the 5.9 litre/361cu in unit known as LS-3/361 giving 360bhp at 5200 rpm followed by the PS1/PS3 383 6.3 litre/383 cu in giving 390bhp at 5400 rpm in its most powerful spec. The bore and stroke were changed for the final version of the Chrysler V8 but resulted in the same capacity and power figures. All cars had 3.3:1 back axles and power steering. A set of six suitcases could be ordered as extras. All cars had particular hub caps and wheel trims and steel bolt-on wheels. Independent front suspension with coil springs and a live rear axle with leaf springs, 3.31 or 2.93 ratios. Brakes were initially drum brakes with servo, but disc brakes became optional from September 1960. Standard on EX2. 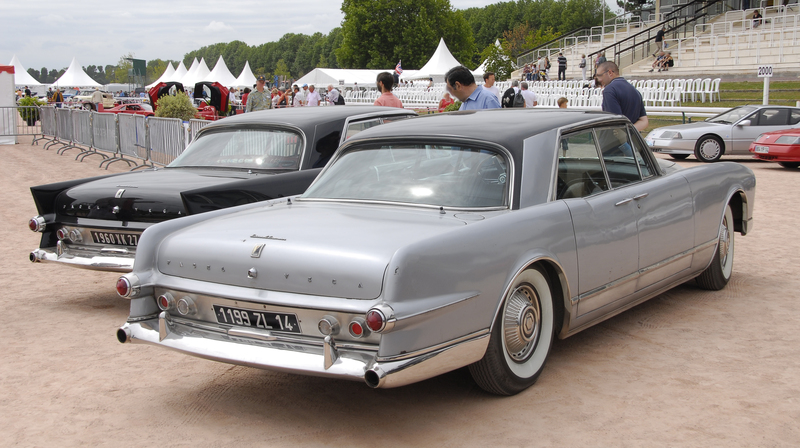 Schedule: The prototype was shown at the Paris salon in 1956 and 1957, but type approval was only given on May 9, 1958. All subsequent 10 cars were delivered in September 1958, the last to Ava Gardner. None were right hand drive. Specification: One manual, the rest were automatic. Apart from the prototype, all had the 6.4 litre/392 cu in C-300-C engine, mechanically similar to FV4. 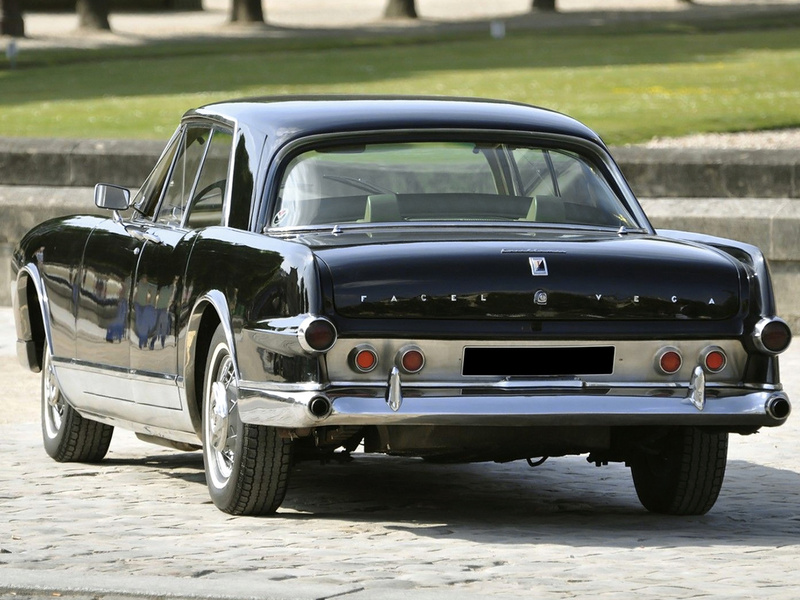 Facel boasted a top speed of 200kph/124 mph. Schedule: The first car, chassis EX1 B001, was given type approval on September 22, 1958. The first of 13 right hand drive cars was delivered to HWM/Intercontinental Cars as their demonstrator initially in March 1959 (they actually only handled 12 of the Excellences, the 13th went directly to Australia where it still resides). The last EX1 was delivered to the Lebanese agent in June 1961. Specification: Five of the EX1s had disc brakes. Mechanically similar to HK500 with 5.9 litre Wedge engine, giving 355bhp in automatic form with single Carter, 360bhp with twin Carter and manual gearbox. Later, the 6.3 litre engine was phased in, giving 390bhp with the twin Carter, manual set-up. The drum brakes were bigger on the EX1 than the EX, but there were also disc-braked versions. Schedule: Production schedule and delivery of the eight EX2s is decidedly indistinct and haphazard. The first production number was actually the third last EX1 and first registered on June 5, 1964. All EX2s not only had EX2 chassis numbers, but EX1 chassis numbers as well. For instance, EX2 C001, the first EX2 chassis number, was given the fifth last EX1 chassis number. But it gained type approval on July 7, 1961. EX2 C002 was the only right hand drive car. Several other EX2s were only completed in 1964. Specification: Bodily quite different in that the rear end tail fins of the previous models were smoothed off. They also had ‘flat’ rather than wraparound windscreens. Two manual cars, six automatic. All had disc brakes. They used the 6.3 litre engine, giving 390 bhp with the dual carbs.